Today's guest blogger for VetGirl is Dr. Janet Olson, DACVIM (Cardiology) of Veterinary Cardiology Specialists. Dr. Olson is also the founder of BART, Basic Animal Rescue Training! She tells us all we need to know about optimizing and interpreting our ECGs! 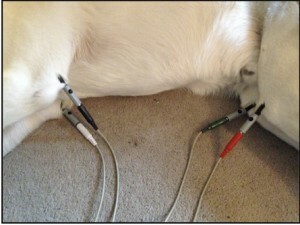 An electrocardiogram (ECG) can be a critical tool in diagnosing and managing heart disease in dogs and cats. However, interpreting an ECG can be challenging even with the best recording. Have a poor recording, forget about it. 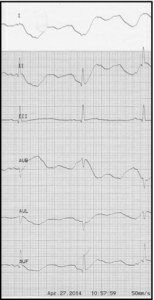 So here are 4 quick tips for optimizing your ECG acquisition. 1) Proper patient positioning and restraint is a must. 2) Lead placement must be consistent and according to convention as all the normal values (amplitude and duration measurements) are based on standardized lead placement. Note that most leads are colored coded as noted , but not all, so check the labels on the leads. 3) Proper ECG Settings: paper speed (mm/sec) and gain (scale in mm/mV), will make it easier to interpret your ECG data. Standard gain setting is 10 mm/mV, but can be adjusted as needed for best interpretation. Two paper speeds should be acquired. - A short strip at 25 mm/sec. This is where your amplitude and duration measurements are meant to be acquired (ECG “C”), but this speed is not always best for rhythm analysis. A longer 3 to 5 minute recording at 50 mm/sec. This spreads out the wave forms for rhythm analysis with better assessment and identification of P, QRS and T waves, particularly in patients with high heart rates (ECG “D”). Look at the 6 lead ECG labeled “E” to the right. The 6 leads are noted, I, II, III, AVR, AVL, AVF. If only a lead II ECG had been performed, there would be question regarding the presence of a P wave on the 4th and 6th complexes from the left. Having only a lead II to interpret, junctional escape beats may have been suspected. However, when looking at the other leads, a P wave is clearly present (inverted in leads III and AVF) and an accurate diagnosis of a sinus arrhythmia with a wandering pacemaker can be confirmed. Look at the 6 lead ECG labeled “F” to the right. There is tremendous motion artifact noted in all leads except lead III. This was created by movement in the right forelimb during the ECG acquisition. If only a lead II ECG strip had been obtained, this would have been an uninterpretable ECG. But, we can see from lead III that this is a normal sinus rhythm. * avoiding artifact is best.